The dates of the carnival this year are: February 15, 2014 – March 4, 2014, with a foreword February 14th (Valentine’s Day). 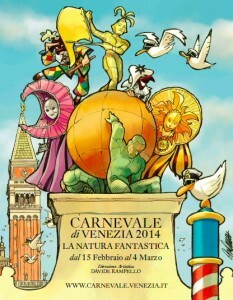 Today the Art Director gave a first glimpse of the 2014 edition of the Venice Carnival. This year is a follow-up of the ambitious project of the last three editions of structuring the event by characteristic and distinctive ‘formats’, focusing on one hand on the return to local historical tradition and on the other on the promotion of the great theme of the masked city. This strategy, agreed upon by the Art Director, the City Administration and Vela spa, which takes over the management of the event from Venezia Marketing & Eventi spa, will continue for the next two editions of 2014 and 2015. A fairy-tale and fantasy Carnival. A Carnival of fantasy and nature. This year’s Carnival is globalised because, from its origins, each culture has drawn from its heritage of fantasy and fairy tales as a narrative metaphor of life. This year’s is a modern Carnival because fairy tales and nature are the festive expression of deep themes linked to the relationship between humankind and the environment: the woods, the valleys, the seas, the mountains, the lagoons and the mysterious animal and vegetable creatures inhabiting them. Humankind has always felt the need to narrate the mystery of nature through fairy tales. Global cultures, first in the shape of myths, then in an anthropomorphic shape in the world fairy-tale tradition, deploy an endless wealth of symbols and characters to describe the creation and the origin of life, the atmospheric elements, vegetable beings and animal creatures. The East and the West, Asia and Oceania, the Americas and Europe, Africa: in this fairy-tale Carnival, masks will be inspired by traditional European fairy tales, Arabian and Middle-Eastern short stories, the votive symbols of African and Mesoamerican cultures, Indian, Mongolian and Cathay allegories. The objective will be to encourage party goers to rediscover, through their costumes and through the masked city, the importance of fantasy, both popular and cultured, esoteric and didactic, and its relationship with humankind and the environment. Venice is a well-known fantasy miracle in itself. A fish in a lagoon, a crossroads of Alpine cultures on one hand; the endless water land that galleys used to cross back and forth from Egypt on the other. A gateway between the East and the West, where myths – and fears – of overseas monstrous and surprising creatures were translated into tales, paintings, decorations, to be exported to Europe along the canals and the roads scoured by merchants. During the Venice Carnival, nature and its fruits can find a new interpretation in the mythological characters from classical cultures, in nymphs and Nereids, as well as in modern-time inventions, in which the newly thriving fantasy literature of these years documents the strong interest of contemporary authors. During the 2014 Carnival, a huge fantasy dictionary will be represented in Venice: each mask will become a symbolic material trace of an alluring meeting of space and time, where in some place of our history one or more human beings have conceived a myth and turned it into image and narration. A timeless fantasy dictionary, a huge morphologic map of unbound human creativity, pleased to explore nature and its mysteries, to represent it with shapes, sounds and attitudes, freely travelling in the heads of our ancestors and in those of our children. For the city of Venice, for its cultural institutions, this is the best time to put in the context of the Veneto and lagoon area a fantasy presence: from the Cansiglio woods to the Alps mountaintops, from the Garda vegetable and fruit gardens to the lagoon valleys, from the overseas Eastern islands to the Armenian, Turkish and Greek warehouses (Fondaci). A fairy-tale world is fostered by the fragrances and the flavours of foreigners, developed amidst the secret sounds of the languages that merchants brought from the East and from Northern Europe, documented by the idioms of the Princes and travellers who would take their long journey to Venice, master of civilization. Every day a company of multilingual comedians will liven up the two morning and afternoon parades, where the best masked costumes will defy each other to win the traditional Best Masked Costume contest. Contestants will be selected by spectators who will then vote and may take their favourites to victory. Every day two winners will be selected to go straight to the Sunday finale. The winning style will clearly be the one that pays homage to Fantasy Nature, a recurring theme in the comedians costumes which will be inspired by the animal and vegetable fantasy world. During each parade up to three entertainment companies will perform in street theatre shows, clowning, music and dancing. The shows will be selected according to their consistence with the theme and their purpose will be to liven up the square and involve the spectators. The selected shows will target all audiences and they will also be viewable from afar. Between 1pm and 3pm the square will be animated by a music and dance performance inspired by the world of nature and fantasy tradition. Each evening will focus on a fantasy animal or a mythological creature from the natural world. The selected artist shall perform a show that is a metaphor of the theme or a symbolic-ritual homage. The Art Director will evaluate the proposals for each evening by theme as well as by artist. The show themes will include fantasy metamorphoses like the Phoenix, Leda’s Swan, Daphne’s Laurel Tree; or fantasy animals like the White Lion, the Werewolf Night, the Red Dragon; or more ironic and snarky representations of Donkeys, Rabbits, Foxes, Roosters and any other animals which are featured in international popular culture anthropomorphic irony. Literature, Image and Myth of fantasy nature: animals, monsters and metamorphoses. The theme of fantasy nature, metamorphosis, fantasy creatures mixing human and animal features has always excited human imagination and has been narrated in poetry, prose and drama in countless shapes, by many authors. This year the cultural projects that will be developed and selected will be based on works focusing on these themes, whether in musical, staging, reading, dance, or film format. The theme of fantasy nature unites these shows and events which at the end of the festival will be published as texts in one book. This year the main city campi, traditional settings of entertainment and performance projects, will be coordinated on the metaphor of Fantasy Nature, in music and design, creating a Forest Living in a city of Stone. The idea is to prepare actual plant/flower arrangements with the (temporary) planting of trees and other plants to decorate the traditional stages and recreational facilities. A musical programme will be developed for a young audience and it will be possible to dress up as, put make up on or simply wear the mask of the symbolic animal that the campo will be named after: Campo of the Grouse, of the Donkey, of the Wolf and of the Fox. Each campo will feature an animal inhabiting the fantasy Carnival Forest.